Nails are often done up in one particular way, either you colour them with a single colour or with the popular French manicure. It’s nicer to give your nails, a little more than the look of a single colour. Rainbow manicure looks pretty and alluring . It is as easy as to do as it looks amazing. You too can do up a rainbow manicure at home without having to burn your pocket at a salon, whenever you like. We are here to guide you how to get the rainbow manicure effect for your nails in more than one way. Follow this simple step by step tutorial and get yourself a gorgeous rainbow manicure. You would need these things in order to get a lavish look for your nails. 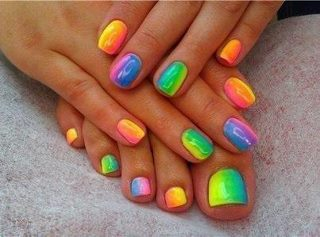 You would need a set of seven rainbow colours or gamut of colours using which you want to do the rainbow manicure . Step 1: Decide how many colours you want to get the rainbow with. Bright colours look best for rainbow manicures. You can even do a rainbow manicure with monochrome look of seven shades of same colour or go for a bright hue based rainbow manicure. If you like the neon’s or pastel shades, combine either one of a kind or mix and match seven contrast colours for rainbow effect. Step 2: You need to make sure your nails are fine shaped, manicured before going further. To start, first apply base coat. By applying the base coat, you are protecting your nails from turning yellow due to application of dark colours. Also, with base coat, you are now set to advance to next step for your rainbow manicure. Step 3: Start your rainbow manicure with a light shade, and transcend light to dark. Pick up a striper brush, dip it in pink neon polish (or any colour of your choice) and then create the first thin French tip of your chosen colour. Step 4: It’s important to keep cleaning your striper brush before using it to apply a new colour. To clean off the striper brush, dip it in a bowl of nail-polish remover and before you use it to apply another colour, dab it on a cloth to make sure it’s clean. Step 5: It’s now time to create second French tip, dip it in the second nail polish colour to create the arch, following the first one. Follow step 3 and 4 to create all seven layers of the rainbow. Step 6: To create a salon like finish, creation of French tips will require a little practice. For some of you, the rainbow will come right at the first go, for some, like we said a little practice and you’ll perfect this gorgeous looking manicure. Step 7: Once the seven colour French tips are dry, completely, brush the fingers with top coat to protect. Your nails are now rainbow manicure ready to flaunt! If you are apprehensive to create the French tips for all seven colours aptly, you can still get the splendid look of Rainbow Manicure, with the below steps. This alternative rainbow manicure technique is easier and looks if not more, equally gorgeous. Take a clean bowl of water and drip all seven colours in the water. Swirl the colours with a toothpick, to make sure all the colours find a place. At an angle, dip your finger nail in the coloured polish ripple. Clean the excess nail polish with a ear bud and remover. 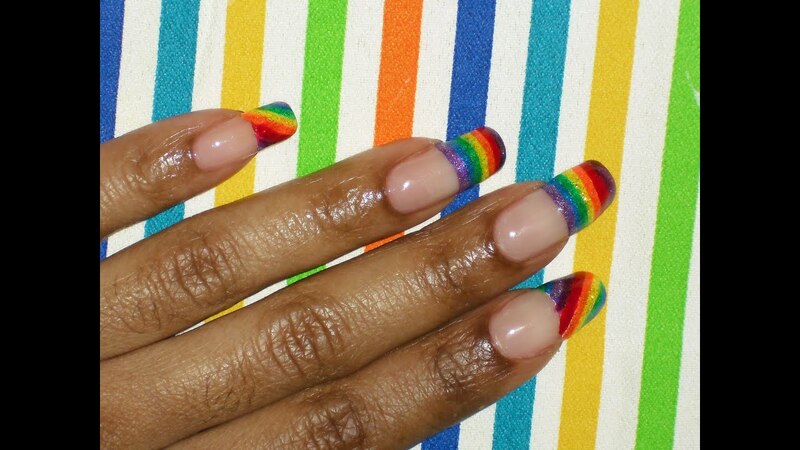 Your nails are now trending with an easy to do, multicoloured rainbow effect manicure.